Our purpose was to identify unmet needs and develop recommendations for a better mental health and addiction system for Aotearoa New Zealand. We wanted to set a clear direction for the next five to ten years that Government, the mental health and addiction sectors and the whole community can pick up and make happen. Read He Ara Oranga : report of the Government Inquiry into Mental Health and Addiction released on 4 December. Other versions of the report's findings are available on our website. UPDATE (January 2019) – Oranga Tāngata, Oranga Whānau, the analysis of Māori submissions, is now available. Watch the above animated video about the report's findings in English. You can also view He Ara Oranga's findings in the above te reo Māori animated video. 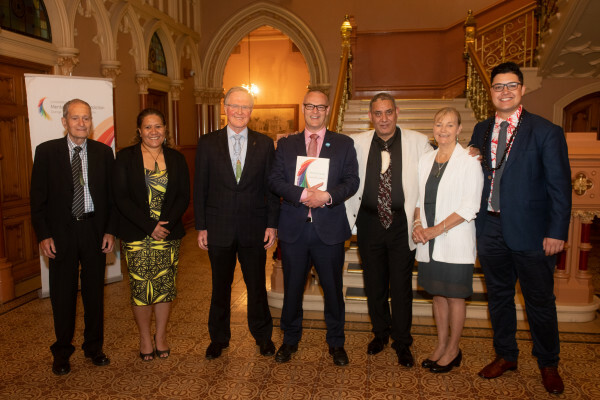 Introducing the Inquiry Panel - Sir Mason Durie, Dr Jemaima Tiatia-Seath, Professor Ron Paterson (Chair), Minister Clark, Dean Rangihuna, Dr Barbara Disley and Josiah Tualamali’i at the handover of the report to the Government on 28 November.